On August 9th 1944, Sgt. 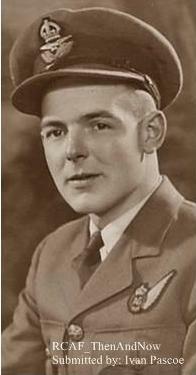 Ray Andrew was posted to 419 squadron after he and his fellow crew members had completed their HCU training at No. 1659 C.U. In addition to Air gunner Andrew was Pilot F.F. Bruyns, Navigator R.C. Joyner, Bomb Aimer F/O H.H. Hudson, Wireless Operator F/O R.R. Biccum, Flight Engineer F/S W. D. Lockie RAF, Rear Gunner Sgt.R.S. Grant . Their first operation would be on August 27th., their second operation on the night of August 29/30th would be a challenge and not their only one to over come in their 30 plus operations together. On this second operation while returning from Stettin and just leaving the Danish coast the starboard outer engine failed and Bruyns was unable to feather the propeller. The engine caught fire briefly and they were able to put it out. Three sorties later on the night of September 27th while making the bombing run on the target, Bottrop, the Lancaster was hit by flak punching holes in the port gas tank and port wing. The flak also penetrated the rear turret luckily no one was injured and they continued on to base. On two separate occasions they were set on by night fighters. On night of November 21st a Ju88 approached from the starboard side and was seen and fired on by the rear gunner Sgt. Grant. As second gunner Andrew's duty was to visually check all other quarters of the sky, especially the darker sections for additional hostile aircraft trying to catch the gunners off guard. The second Combat Report comes from February 7th, when yet again a Ju88 attacks their aircraft this time from directly behind and directly at the rear gunner. It must have been a great temptation for P/O. Andrews to engage the fighter to help the rear gunner, but strict training kept him searching the skies for any additional enemy attacks. Born and raised in Pickering, Ontario, from a family of six. 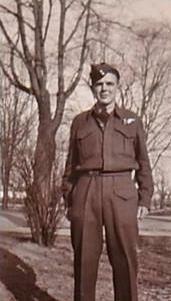 Ray Andrew, along with his four brothers all signed up to fight for Canada's War effort during World War II. His brothers joined the infantry and armoured divisions, while Andrew went a little different route to join the R.C.A.F. Formed at Mildenhall on 15 December 1941 as part of No 3 Group, it was the third RCAF bomber unit to formed in this country. It initially operated Wellington IC and III aircraft and having moved north to Leeming and then Topcliffe in August 1942 to join No 4 Group, it moved again in September to Croft and once again in November to Middleton St George. It now settled here and in the same month converted to Halifax II heavy bombers. In January 1943 the squadron transferred to the newly created No 6 (RCAF) Group and continued to operate as part of Bomber Commands Main Force for the remainder of the war, converting to Lancasters in March 1944. Ray had many good and bad memories throughout his time in the R.C.A.F. The tragedy of losing great friends/comrades over seas as they did their bomb runs. And situations where you counted your blessings because you knew someone was watching over you. At the time of these bombing raids, there was a song on the radio called [Coming in on a wing and a prayer], Andrew and his crewmen knew this song well, for it related to their every day life in the R.C.A.F. Ray moved on with his life to family and friends after the squadron returned to Canada in June 1945 and disbanded on 5 September 1945.
and Ivan Pascoe for sharing the photos and story.